This week, we've talked about some of the great innovators of the past - including a few, like Estee Lauder, who succeeded against the odds. 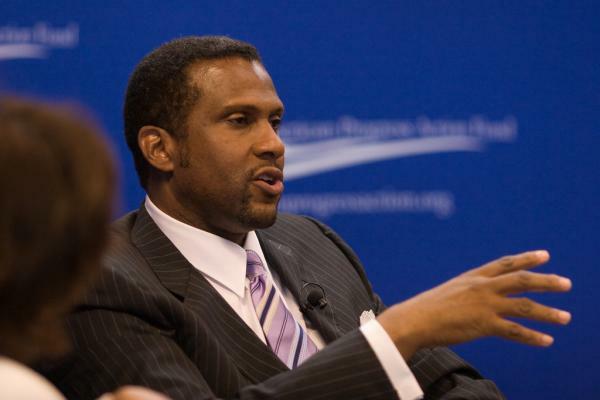 Recently, we caught up with Tavis Smiley - author and host of "Tavis Smiley" on PBS - and asked him: what does it take to succeed, especially for women and minorities who have historically been sidelined? The key, says Smiley, is being willing to fail. In fact, he says one quote in particular from novelist and playwright Samuel Beckett has provided him with guidance on getting comfortable with the idea of failure: "Ever tried, ever failed, no matter. Try again, fail again, fail better." Smiley points to one incident in particular that inspired him to "fail better." Currently, he does not own the right to his own domain name on the Internet - it was purchased by cyber squatters early in his career, and each year they increase the price. Tavis - who has been using the domain name "tavistalks" for seventeen years - refuses, as he says, to pay for the name his mother gave him. But it taught him a valuable lesson: always be on the lookout for the next big thing. In the end, says Smiley, the most important thing is persistence - even when things don't go exactly right the first time. "You never know when you try something if it's going to fail or not," he says. "But I will not be out-hustled." Want to hear more from our conversation with Tavis? Tune in to the full, extended interview above to hear Smiley share more of his lessons on success. Read more from Tavis Smiley at The Huffington Post.